You are here: Home / Reviews / Marvel Reviews / DEATH OF WOLVERINE Deadpool and Captain America – ADVENTURE! DEATH OF WOLVERINE Deadpool and Captain America – ADVENTURE! For the uninitiated, let me get you up to speed. Captain America is a super soldier, who fought in WWII, was frozen in ice, and revived in modern times to lead the Avengers. Recently, he got the super soldier serum sucked out of him in a fight, because comics. This has left him a frail old man, but an old man with the skills and battle knowledge that he has acquired over the last half of century. Deadpool is another super soldier, of sorts, made stronger by the Weapon X program, the same one that bonded adamantium to Wolverine. He also breaks the fourth wall, a lot, and knows full well he is a comic book character. Now, on to this issue! Right from the cover, you know that this is a book less about the serious ramifications of Wolverine’s death, and rather the fun and weird adventure you could expect from such a random team up. 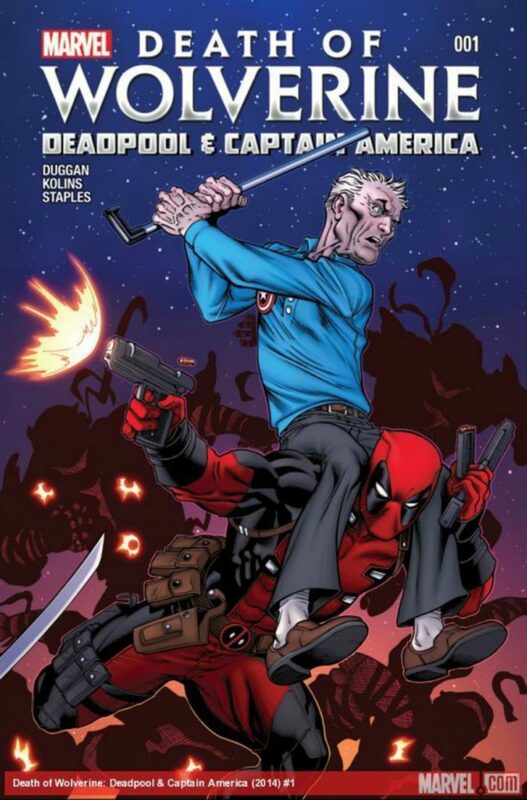 Aged Captain America riding on Deadpool’s back, swinging his cane at ninjas is a sentence I always wanted to write, and I can only imagine what the cover artists Ed McGuinness and Morry Hollowell must have felt. That is not an image you get to think about everyday, much less draw as a cover to a comic book. The issue is straightforward in it’s absurdity. Written by Gerry Dugan and drawn by Scott Kolins and Veronica Gandini, the story is presented in the most “comic book” way possible. A odd couple pairing, with Cap drawn really old and Deadpool drawn really colorful. Wolverine, Captain America and Deadpool have worked together in various team sets and adventures over the years in the comics, and this gives both these characters a chance to reflect on some of those times long past. This adventure though, is slightly more important than the light hearted approach these two veteran heroes portray it as. 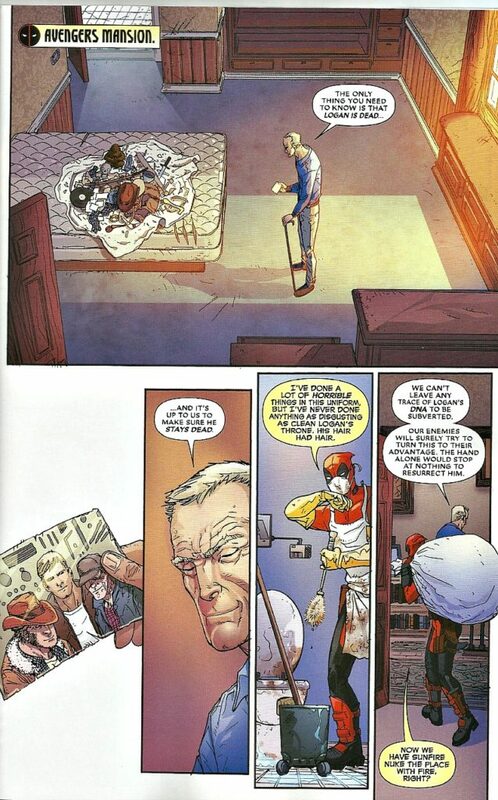 With Logan dead, Steve Rogers is worried that someone might try to clone him and bring him back for evil purposes. Totally a legit worry, as Wolverine racked up many enemies throughout his life, and left a lot of DNA lying around. 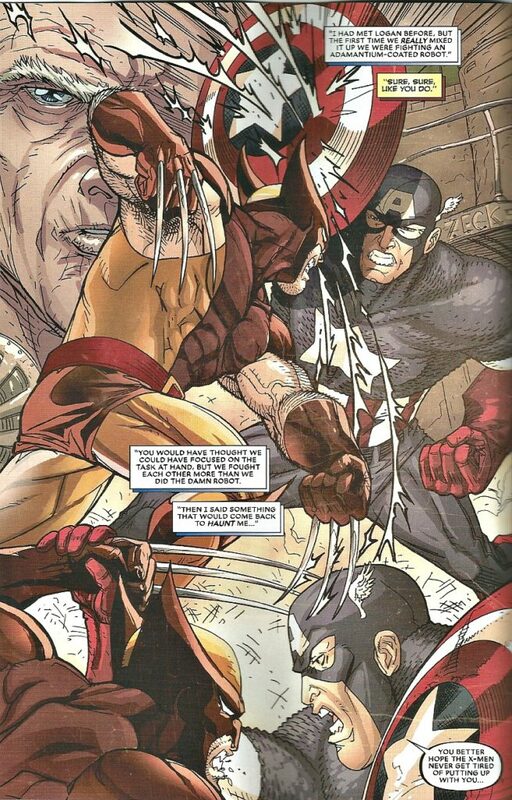 So after Cap employs Deadpool to help him scrub Logan’s living quarters and burn his personal effects, they set out on a quest to locate a knife used to cut Wolverine recently, that has already fallen into the hands of A.I.M. Hilarity ensues. For real though, this book comes across as one that might feel like a throw away adventure, but the end really got me thinking. What if someone were to try and bring Wolverine back that way? Would he come back feral and animalistic like he was after Weapon X? Or even further back, would he be like he was before all of his training and life knowledge? It is a weird idea to play with, and the end of this book leaves that question dangling in the ether, with an answer maybe in the future, maybe not. The pairing of these two characters is funny, and yet somewhat sad and purposeful, considering their connections to Wolverine. It is almost like he would have wanted this adventure between these two to happen in some form or another, and that makes this book stronger. Also, the end is very cool, and could be looked further into down the road. Or not, who knows what crazy things Marvel has in store for 2015. On the whole, this is a throw away story. It’s fun, but you almost get the feeling a few times it might not even be happening, because Captain America especially seems really out of character. Is this all just a psychotic episode that Deadpool is happening? Again, we may never know the true answer. CBH Score: 3.5 out of 5. Not necessarily a must have book, but fun nonetheless.